Jan. 28, 2019—On Jan 22 the South Carolina House of Representatives became the first state legislature in 2019 to pass a resolution calling for Congress to establish a National Infrastructure Bank. The proposed Bank, modelled on the successful national banking systems of Alexander Hamilton, John Quincy Adams, Abraham Lincoln, and Franklin Roosevelt, is cited as part of a four-point American Recovery Program. A model bill for such an infrastructure bank is available here on this blog. While numerous national organizations, such as the Democratic Municipal Officials and the National Federation of Federal Employees, have endorsed this concept, no bill has yet been introduced into the Congress. 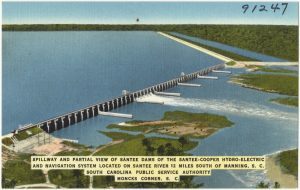 This dam at Lake Marion, South Carolina, was built by the WPA as part of rural electrification. The memorial, Concurrent Resolution H3677, passed by a voice vote in the House, and has now been referred to the State Senate Finance Committee. Launch a John F. Kennedy-style initiative to rebuild our space program to explore the solar system and inspire future generations. John Kennedy inspired many generations with his bold vision of going into space. This time America must go to the Moon, and stay, and go beyond. America, through its President and the Congress, also must launch a crash program to develop nuclear fusion, which President Kennedy also called for, to finally solve the energy needs of the nation and the planet. Similar resolutions, each with references to their own state history and needs, have been introduced into several other state legislatures to date, including Illinois (House), Minnesota (Senate), Missouri (House), Rhode Island (Senate), and Virginia (House). Watch for more news soon.